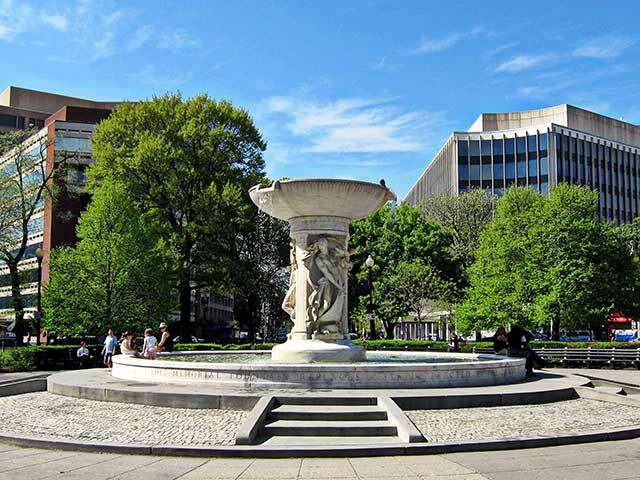 Named for a scion of the prominent Delaware family, Dupont Circle evolved from a hardscrabble “wilderness” to become Washington’s most fashionable address at the close of the nineteenth-century. Today it is one of D.C.’s most vibrant neighborhoods (Kramer Books stays open 24 hours a day on the weekend.) It also plays a central role in any history of Washington’s LGBTQ community. Mansions and elegant row houses from the early 1900s remain, many serving as single family residences; others functioning as museums, bed and breakfasts, embassies, or non-profit organizations. We’ll start with a look at a “brewmaster’s castle,” then it’s on to Dupont Circle itself, where people watching and chess matches are favorite past times. Nearby is a former luxury apartment building that can claim a direct connection to the National Gallery of Art. A church that rose from the ashes to become a beacon of social activism is next, followed by a block of stunning row houses designed by Thomas Franklin Schneider, one of D.C’s. most prolific architects. Two blocks away he developed the apartment tower that gave rise to the District’s building height limit. The stroll back to the Dupont Circle Metro station travels along Corcoran Street, one of the neighborhood's most charming byways, lined with ginkos trees and restored rowhouses, a few of the latter faced with sculpture created by a former Dupont resident. No reservations necessary. Simply show up! $20 per person (kids 3 and younger free). $5 discount with U.S. military or federal government ID. Pay in advance or with cash or a credit card when you arrive.